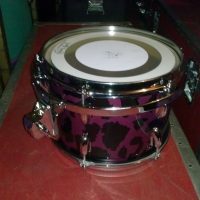 This one of a kind 2008 Slingerland Radio King set was custom made for groundbreaking rock drummer Carmine Appice. 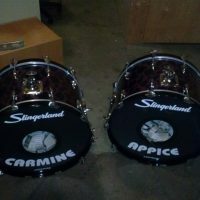 The entire set is made up of Slingerland Radio King shells with thick maple reinforcing rings. 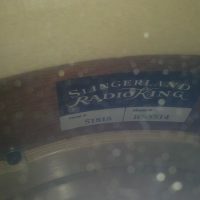 This is the only complete set of Radio Kings made by Slingerland during this era. 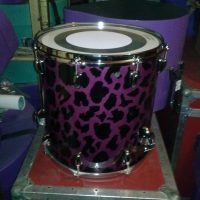 The purple leopard metallic lacquer paint job is also a unique custom finish made exclusively for Appice. 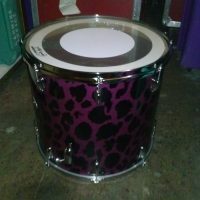 Slingerland made Carmine sets in pink, red, gold and purple leopard finishes. 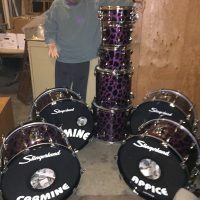 The Purple set is the only Radio King set. 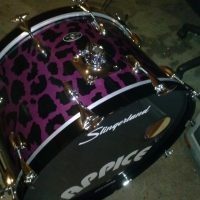 This set is the last set Slingerland ever made before closing their factory in 2008. 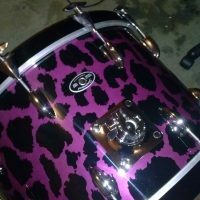 All of the drums have gold plated hardware. 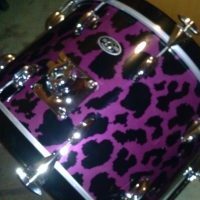 The set includes 12×8″ and 13×9″ rack toms, 16×16″ and 18×18″ floor toms and FOUR bass drums. 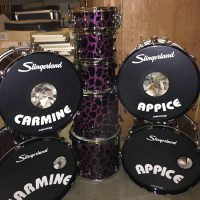 Appice wanted the option of a pair of 22×14″ or a pair 24×14″ bass drums, depending on the size of the venue or studio he would be playing in. 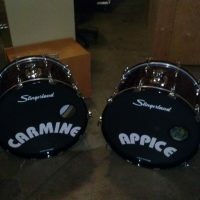 All of the bass drums include “Carmine Appice” logo heads. 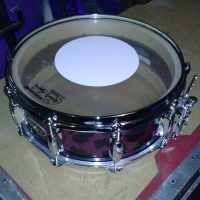 The set is brand new condition. It has never been played. You can still smell the lacquer when you open the cases. 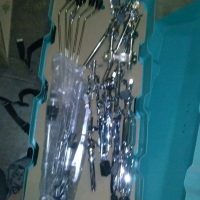 The set includes all of the hardware in the photos and pro-quality molded cases. COA signed by Appice and seller. 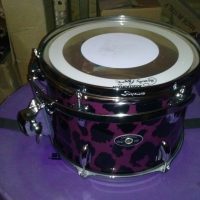 If requested Appice will sign the shells. More photos available soon. 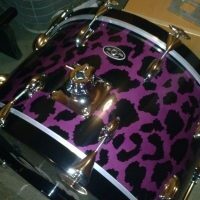 PRICE: $17,995. Serious offers considered.